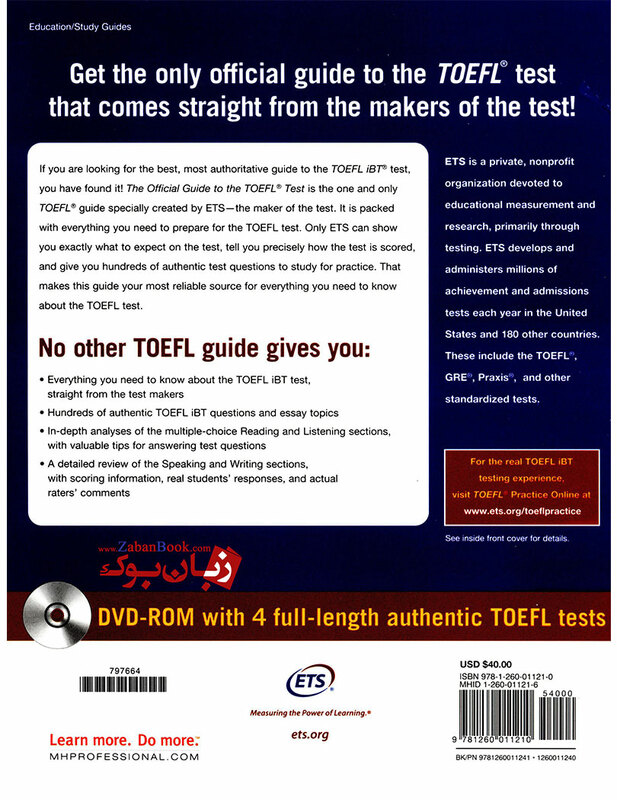 The new Official Guide to the TOEFL® Test is the best, most reliable guide to the test that is used to meet English-language proficiency requirements at more than 10,000 institutions worldwide, including top universities in Australia, Canada, the U.K. and the U.S. This completely updated fifth edition includes real TOEFL test questions for practice, as well as explanations of all four sections of the test. The guide provides learners with information on how to integrate reading, listening, speaking and writing skills in order to construct effective answers that demonstrate university-level English proficiency. اولین نفری باشید که در مورد کتاب افیشیال گاید تو تافل برای آزمون تافل ویرایش پنجم The Official Guide to the TOEFL Test 5th نظر می دهد. ارائه دهنده ی کتاب های آموزش زبان، فلش کارت ها، پوستر های آموزش زبان برای تمامی مقاطع.